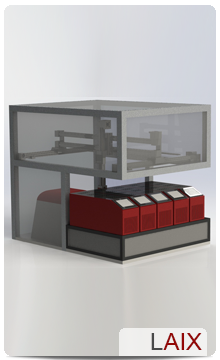 Our "Economy" version is the perfect solution to benefit from the advantages of automation even in laboratories with smaller sample throughput! It offers a lot of comfort on a small footprint (850 x 800 mm) and of course also meets the AOCS and UIPAC standards. From its "big sisters", our latest automation has received many features: the proven software SFC Application 2.2, the error-free positioning system, the sensor-controlled sample transport, the standard LIMS interface and the temperature and time monitoring with alarm. There are eight temperature baths available, divided into a heating block (ambient temperature up to 100°C), a cooling block (0°C up to ambient temperature) and 6 blocks for temperatures between 5°C and 60°C. Optional, a barcode scanner can be integrated.